Detectives need assistance in identifying this suspect relative to a Robbery 1st/ Abduction that occurred on June 17,2018 at approximately 4:40 p.m. in the 4400 block of Maryland. The victim, a 25-year old white female, was walking to her vehicle, and when she opened the vehicle door the suspect, described as a black male in his mid-thirties, 5’9” to 6’0” tall, wearing a white t-shirt with Looney Tunes characters, and a blue baseball cap, approached her. The suspect produced a firearm, and demanded the victim climb into the front passenger seat. The suspect then entered the driver seat and drove the victim to Natural Bridge and Union, where he used the victim’s ATM card to make several withdrawals. The suspect drove around for a short while, and eventually parked the vehicle at the Wohl’s recreation center, located at 1515 N. Kingshighway, where he fled on foot. 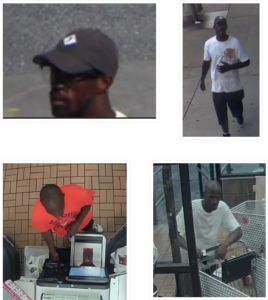 The suspect is believed to also be responsible for two other robberies described below. One robbery occurred on June 12,2018 at 8:19 p.m. at 18 S. Kingshighway. The suspect followed the victim, a 37-year old white female, to her apartment building and robbed her at gunpoint. The suspect later used the victim’s credit card at the Schnucks, located at 4171 Lindell, on two separate occasions. The surveillance photos are attached. The additional robbery occurred on June 15,2018 at 6:15 p.m. in the 600 block of Clara. The suspect approached the victim, a 29-year old white female, as she approached her apartment. The suspect produced a firearm and demanded her property. The victim relinquished her money and the suspect fled the scene on foot. ALL TIPS INTO CRIMESTOPPERS ARE COMPLETELY ANONYMOUS. WE HAVE NO CALLER ID, NO VOICEMAIL AND NO WAY TO TRACE AN IP ADDRESS. ALL TIPS MUST BE CALLED OR EMAILED DIRECTLY INTO THE CRIMESTOPPERS TIP HOTLINE ONLY OR MUST BE RECEIVED THROUGH THE FREE APP TO BE ELIGIBLE FOR THE CRIMESTOPPERS REWARD.